This article explains the vital role Friction has to play in Rock Climbing. Thanks to Richard Jones and Glen Harding for their input. 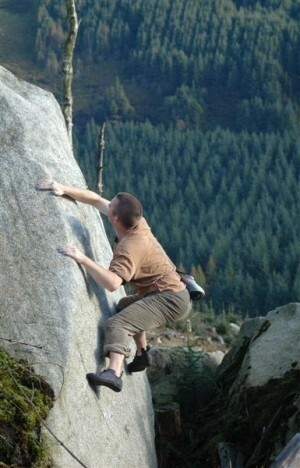 Friction is the magic ingredient in bouldering and rock climbing. It’s what makes the best moves and sequences subtle and surprising. Friction is a variable, some days it’s better than others and on the right day anything is possible. It’s the reason we go out in our down jackets and woolly hats on those freezing cold winter days. But is it as simple as that? What other factors influence friction? Should climbing shoes be soft or hard? Does chalk really help? Should we get as much rubber on the rock as possible? Does our foot slip because there was too much weight on the hold or too little? The frictional force is always exerted in the opposite direction to the object’s movement or potential movement. The COF has to be measured experimentally, it cannot be found through calculations. 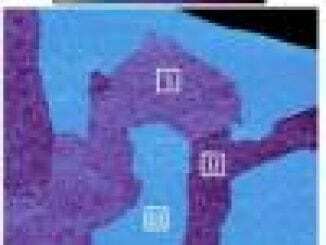 It is a property of the two surfaces interacting, for example the COF of rubber on ice is different to that of rubber on rock. The rougher the surfaces the higher the value. There are two types of friction, dynamic and static. As regards our hands we are only interested in static friction as once the relationship becomes dynamic you have slipped and are mat bound. “The one item I might seriously quibble with you about is when you say that you’re interested only in static friction, not dynamic friction. What you say would certainly be true if you were talking about anything other than rubber, because static friction is usually higher than dynamic friction, so once you start to slip you keep on going. But yet again, rubber is different. The true contact area (at asperity tips) is much smaller than the apparent contact area. You will notice there is no mention of contact area in the classical approximation of the force of friction, this is because friction is independent of the contact area (in theory). To the naked eye a material may seem smooth but if you look at it closely it will appear rough. When two materials are in contact it is the peaks of this roughness, known as asperities, that actually touch. So the true contact area is less than the apparent contact area (see below). For example the true contact area of a car’s tyre is usually about 1% of the apparent contact area (source). Consider a brick on a table. 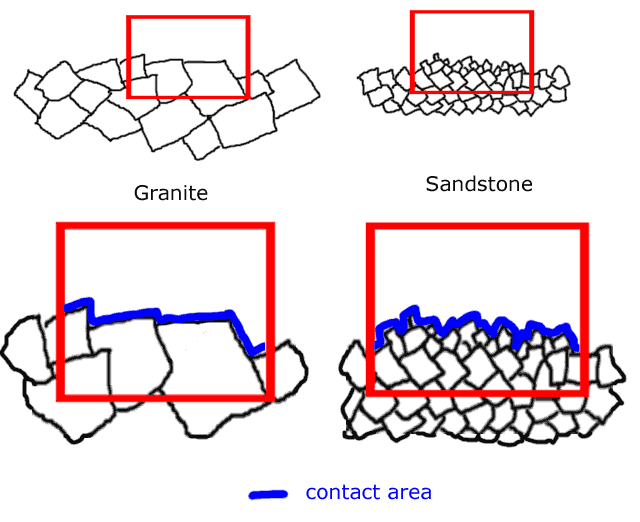 When the large side of the brick is in contact with the table (large apparent contact area) there are a large number of asperities that support the load. 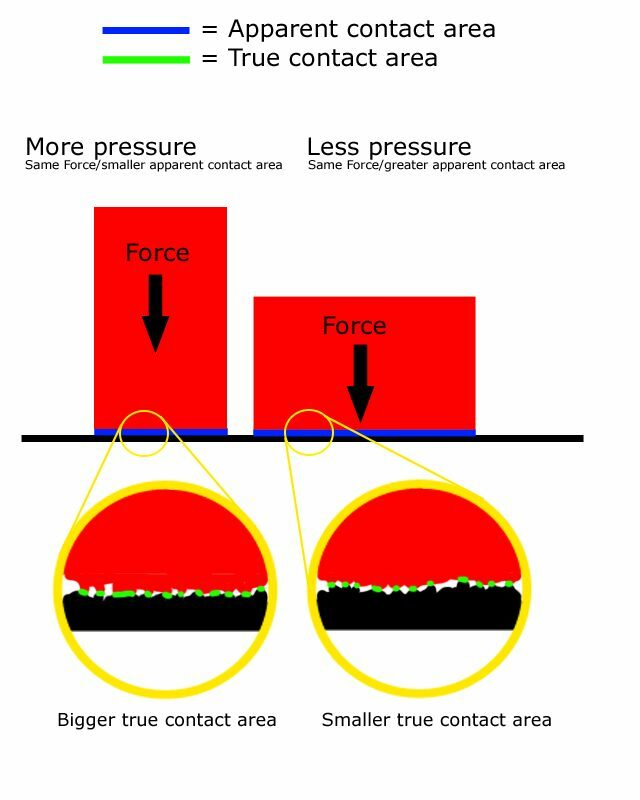 When the small side is in contact (smaller apparent contact area) there are fewer asperities but the area of each asperitie is larger due to the higher pressure (same force, smaller area) so there will be no difference in the amount of friction. Hence friction is independent of surface area. Forget about all that for climbing as the classical approximation of the force of friction applies to most materials but not rubber and skin. 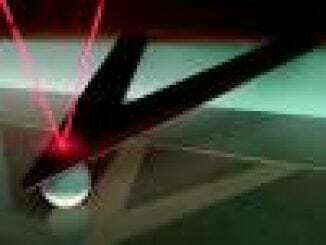 Friction, as scientists talk about it, applies to two smooth parallel materials sliding against one another. Not one hard, irregular surface (rock) pressing into a soft, supple surface (rubber or skin). This means that for rock/rubber/skin interaction the apparent and true contact areas are the same and hence friction is proportional to the contact area. This is why when smearing you should get as much rubber in contact with the rock as possible. Softness allows rubber or skin to mesh with rock and roughness ensures the contact area will be large. 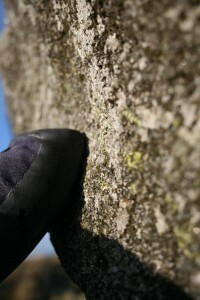 For optimal grip we want rough rock (up to a point, we will come back to this later) and soft but not too soft shoes. There are two aspects to friction, the hands on rock and the feet on rock and it’s worth look at them separately. Deformation Also know as mechanical keying, the pressing of rubber on rock results in the deformation of the rubber by the asperities of the rock. The more load on the rubber the more penetration. 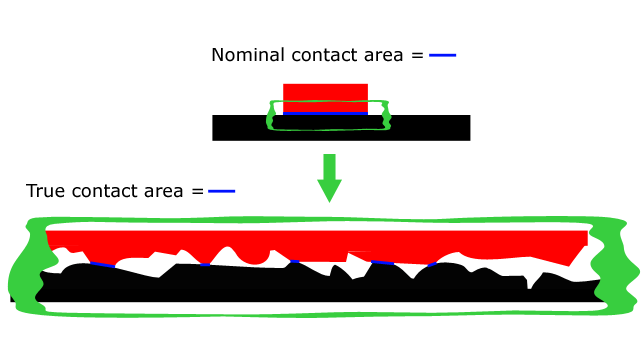 Adhesion is proportional to contact area. This is destroyed by dust or water. Wear Imagine the resistance generated by shaving a thin layer of rubber from your shoes this is a macro version of friction due to wear. This isn’t a good thing and costs us a fortune. Rubber needs to be soft to allow it mould to the rock but if it’s too soft the rubber will deform and slip. For a given compound of rubber the softness will vary with temperature hence the friction of rubber varies with temperature. Emily Harrington heel hook on Golden Gate climb. When a F1 car is racing around the track it’s tires heat up. The rubber compound used in the tires is designed to work best at this high temperature. This is why the teams pre-heat their tires so they work optimally from the start. Similarly climbing shoe manufacturers design their shoe rubber to work best in a specific temperature range (0-5° centigrade), below this the rubber is harder and won’t mould well to the shape of the rock and above this the rubber will be too soft and will deform too easily. This why climbing shoes work best in the cold. 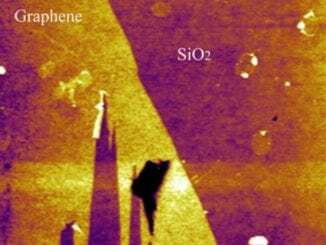 Why was 0-5° range chosen as the optimal performance temperature for climbing shoe rubber? Because it is too cold for the hands to sweat but not too cold to warm up. Why don’t they design the rubber to work well at a more normal temperature of say 12°? Yes shoes would work best but the hand grip would be sub-optimal and therefore you would never have optimal hand and foot grip at the same time. When edging the contact area is limited to the size of the edge. Standing on a small edge is a mechanical act, friction isn’t the deciding issue, this is why old school nailed boots work relatively well on edges. When edging we want a hard compound rubber that is stiff and won’t deform and roll off the edge. 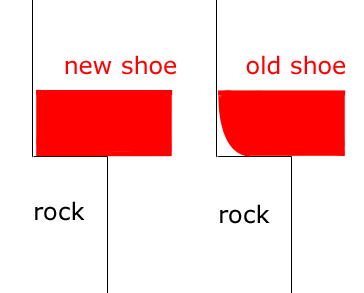 New shoes are better at edging for two reasons, firstly the rubber is harder before it is worn in and secondly the edge of the shoe is better defined so the contact area is larger. Ideally we would have rubber compounds designed for edging and others for smearing. Also since any given rubber compound is designed to work optimally at a specific temperature, one that works best bouldering in Font in January will underperform sport climbing in Spain in June. All rubber compounds are a compromise between these and many other factors. So it seems that shoe and rubber design has a long way to go in terms of customization. Due to its chemical structure when rubber moves across a rough surface it compresses and expands, this deformation at the surface causes energy loss some distance away. This bulk effect is a significant factor in the high friction properties of rubber. This energy loss (hysteresis) depends on temperature and frequency (think of frequency as a measure of roughness i.e. the closer the bumps are together the rougher the surface) and is a major reason why the friction of rubber is so sensitive to changes in temperature. Why don’t climbing shoes have thread? Car tyres have tread to improve contact between the tyre and the road in wet conditions. The thread allows the water on the surface of the road to escape as the tyre presses onto it. Without treads the water is unable to escape and a thin layer of water remains between the road and the tyre’s surface which causes a severe loss of grip. However if the road is dry the tread reduces the contact area between the tyre and the road and hence the grip. This is why threadless tyres are used in motor racing when the track is smooth and dry. We don’t climb in the wet so climbing shoes are threadless to maximise grip. Our skin has a certain amount of strength ie. it can resist a certain amount of pressure P (force over a given area A) be it a low force F on a small area (a tiny crimp on a slab) or a high force on a large area (a big sloper on an overhang). Once the pressure is above this threshold our skin will tear. This is another reason why increasing the contact area is so important, spreading the load will prevent our skin from tearing (P = F/A). We have contours in our skin’s surface called friction ridges that help the hand to grasp by increasing friction. Friction ridges occur in patterns (fingerprint). What properties do we want in our skin to have? It should be smooth so there are no points of weakness where tearing can start (this is why some boulderers use sandpaper to smooth burrs in their skin between tries on a problem). It should be thick but not too thick or else it will rip off in lumps (see photo above). This thickness makes pulling on rough rock more comfortable and can be built up by loads of climbing or manual work. It shouldn’t be too dry as dry skin tears easily, this is why some climbers use moisturiser. 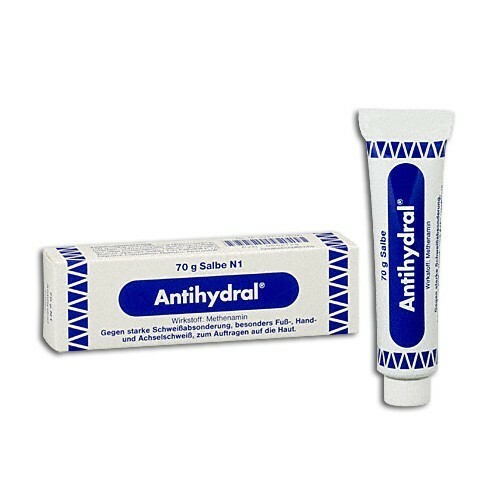 There is a product available on the web called Anti-Hydral cream (a.k.a. Stump Cream) that was designed to keep the skin on amputee’s stumps dry and supple. When applied to the fingertips it thickens the skin and reduces sweating, but be careful it doesn’t dry out your skin by using it sparingly and moisturise regularly. It can be bought www.mycare.de. What happens to our hands in the cold? The cold has a two pronged effect on our hands. Firstly our hands sweat less and secondly our skin becomes harder (the cold reduces the fluidity of the liquids that constitute our cellular membranes). Dry hard hands have better friction than soft, damp ones. The wind affects hand friction but not foot friction. The wind doesn’t influence the temperature of the rock but it does influence the temperature of our hands and thus reduces sweating and increases friction. So what’s the story with chalk? The only really surprising conclusion is that water has no effect on friction. We know that chalk decreases friction but it decreases friction less than sweaty hands do so it’s a necessary evil for most climbers. However I think they are wrong to say that “magnesium carbonate dries the skin, decreasing its compliance and hence reducing the coefficient of friction”, yes chalk dries the skin, yes dry skin has a decrease compliance (ie. is harder) but hardening skin doesn’t reduce the COF it increases it. I don’t think the researchers had much input from climbers. In the introduction that equate chalk and talcum powder which is just wrong. The subjects in their test applied the force to the rock by pushing down on a slab of rock with their fingertips it would be a lot more realistic if the test subjects hung from a large sloping hold instead. I would also suspect that the participants in the study didn’t remove the excess chalk as thoroughly as a climber would. Some of the fancier brands of chalk contain an extra drying agent, this will dry our skin and make it harder. This is a good thing as it replicates the effect of colder temperatures however be sure to wash your hands after you are finished climbing to prevent your skin getting too dry. We know from experience that granite has better grip than slate, this is because granite has large crystals that deform the surface that is in contact with it whereas slate is a very smooth fine grained rock, this means there is a greater contact area for granite. But what about sandstone which is not as rough as granite but has as good (if not better) grip? Rougher is better but only up to a point. Friction depends on the true contact area of the two objects. As the rock gets to a certain roughness the irregularities are so large that the rubber can’t adapt to them. This is the point at which increasing roughness causes decreasing friction. Grain size: Refers to the physical dimensions of individual particles of rock. Grain shape: Sharp grains will have higher friction than round ones. How the rock was weathered ie. by wind, rain, glaciers etc. will influence the grain shape. Sorting: Well sorted (grains of approximately all one size) materials have higher porosity than similarly sized poorly sorted materials (where smaller particles fill the gaps between larger particles). Gritstone is poorly sorted with grains ranging from sand to pebble size. Sandstone is well sorted. 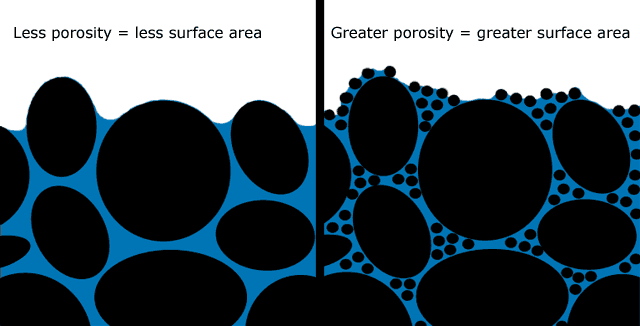 The image below shows how some smaller grains can fill the pores drastically reducing porosity while only being a small fraction of the total volume of the material. Porosity: is the proportion of the non-solid volume to the total volume of a material (see below). Composition: The relative amounts of chemical components in the rock will influence it’s friction. Well cemented : Is it well held together, certain types of granite and sandstone aren’t, when climbed on grains break off and act like ball bearings. A given compound of rubber will work optimally at a certain temperature on a certain rock type, for a smoother rock type the temperature will need to be higher for the same shoes to work optimally. So the rougher the rock the softer the shoes. What happens on a hot day? Our hands sweat but does the rock sweat? No if there is moisture in the air some will, naturally, be present on the rock but on a sunny day the rock won’t start to emit moisture. Even for the same rock type grain size can vary hugely, in this case granite. Nothing in life is simple especially the simple things. 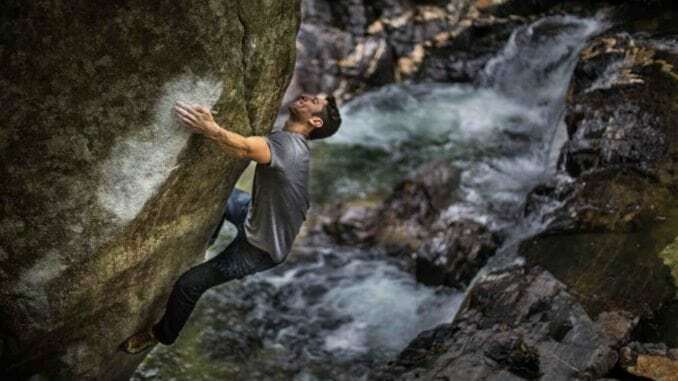 The interaction of rubber and skin with rock is complicated but hopefully this article has clarified some things about how friction and rock climbing interact. It seems that most factors that influence friction obey the law of diminishing returns, cold but not too cold, soft but not too soft, rough but not too rough etc. I don’t know how I feel about the author’s interaction with the research article but it seems like maybe disregarding research just because it doesn’t agree with you is a little wrong. But also, that researcher did not seem to know what’s up with chalk. I mean that F. Li, S Maregetts and I Fowler didn’t seem very experienced with the ways that chalk improve climbing. For example, the quote from their article explains an experiment that ignores at least one variables that chalk aids in (reducing sweat on hands). Furthermore, that water had no effect on the coefficient of friction in this experiment might have been due to the tangential force the experiment participants applied being greater than any force the single hand of a climber would apply while climbing. While I respect the attempt to use a controlled scientific approach, these researchers seemed to ignore a lot of important considerations when climbing. Not that I have any data to support that chalk helps other than anecdotally from being a climber.